Upon arrival in Arequipa, you will be transferred to your hotel for the evening. 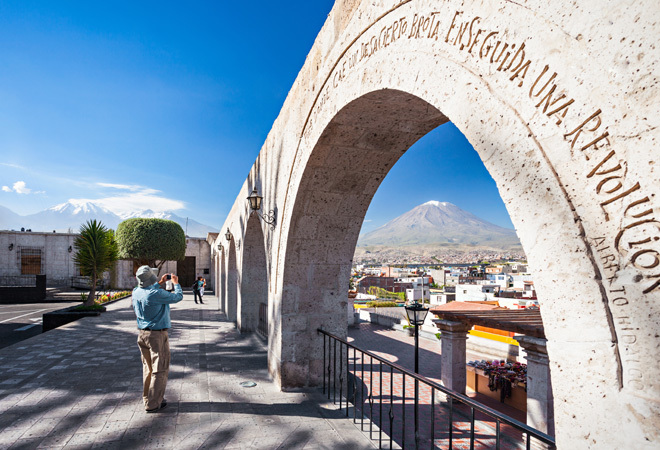 Today you will enter the Pampa Cañahuas Reserve by skirting the volcanoes that surround the city of Arequipa. This is a broad plain populated by vicuñas, native and tamable Andean camelids that are a national symbol. You will then visit Vizcachani, the Toccra Pampas and will skirt the crater of the Chucura Volcano to reach Los Andes Scenic Viewpoint in Patapampa (4910 masl), from where you can see the various volcanoes that surround Arequipa. After you will enjoy lunch at the legendary town of Chivay and in the afternoon you will rest at your hotel for the evening. Meals included: Breakfast and lunch at Balcón de Zacarias. Today you will depart very early in the morning to the town of Canocota, which is located 20 minutes from Chivay. From here you will start your trek and enjoy the beautiful scenery of the Canocota Canyon with their amazing and deep vertical walls, colorful landscape and endemic plants and animals. After trekking, you will have time to enjoy the hot springs in La Calera before returning to your hotel. Today you will start the day by visiting the Condor Cross, from where you will be able to appreciate the amazing Colca Valley, one of the world’s deepest canyons with over four kilometers at its deepest side, you will also get to see the huge and majestic condor flying at a few meters of distance above and around you. Back in Chivay, you will visit the towns of Pinchollo, Maca, Achoma, and Yanque, with stops at the Antahuilque and Choquetico scenic viewpoints. You will return to Arequipa after lunch. You will start your tour in the morning at the Museum of Andean Sanctuaries where you will visit the mummy Juanita, a 14-year-old daughter of an Inca dignitary mummified by cold. She was found at the snow-capped Ampato Mount in 1995 and was exhibited at the National Geographic Society in Washington. You will then go to the Main Square which is one of the most beautiful squares in Peru because it was built of sillar (a white volcanic rock) and has beautifully carved arches. The Main Square is also next to the impressive Arequipa Cathedral, built in the 17th century and fully rebuilt after several earthquakes. You will then head to the Church of the Society of Jesus (1590), considered a classic example of the local baroque architecture, which houses an exceptional collection of paintings and murals. You will then visit the Carmen Alto Scenic Viewpoint, located in front of the Chili River, from where you will have a scenic view of the city before passing by the Yanahuara Scenic Viewpoint. 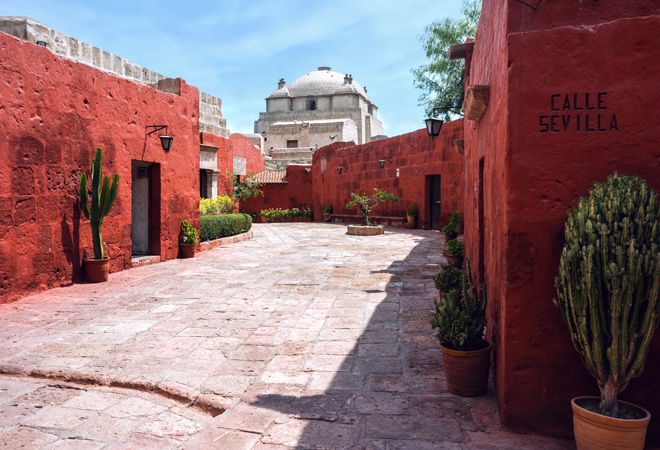 You will end the tour at the Monastery of Santa Catalina, built in 1579, which is an authentic medieval cloister and a small religious citadel used to date. After your tour, you will be transferred to the airport to either continue your tour or return to Lima for your international return flight. 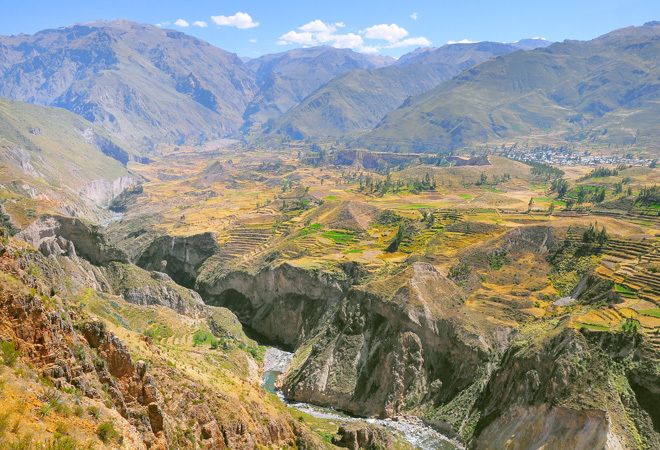 The Colca Canyon offers impressive geological formations and spectacular views to agricultural terraces built by Inca and pre-Inca civilizations, which makes it a fabulous place to do trekking or ride a bike. 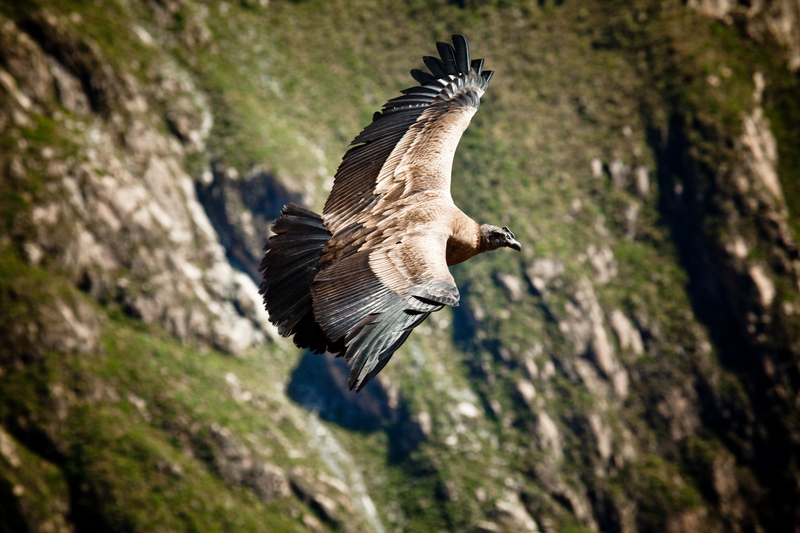 Moreover, it is home to the majestic Andean Condor, which makes the experience even more special. On the way to/from Arequipa, you will spot wild Vicuñas, lamas, and alpacas. 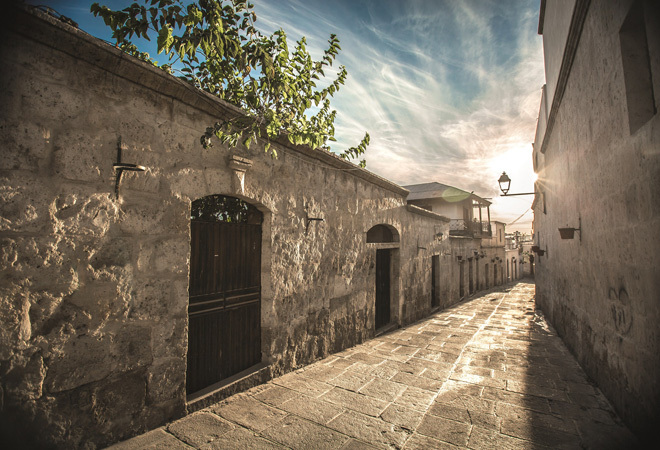 Before leaving Arequipa, you will have a closer look at the city and its main attractions. The following prices are per person in US dollars based on private rates and are subject to change around holidays such as Easter, Christmas, New Years and other local festivities. All transfers airport / hotel / airport are private. Entrance tickets to attractions mentioned in itinerary. Comfortable and light clothing is the most convenient choice for traveling on Peru’s coast, while warmer clothes are best for stays in the highlands. Passengers must not wear sleeveless T-shirts, shorts, miniskirts or very tight clothes when visiting temples, religious places or official buildings. Sunblock lotion, sunglasses, a hat or cap and a mosquito repellent can be also very helpful during the trip.